Jams, jellies, marmalades, preserves, and conserves are sweet spreads made from fruit or juice; they differ in firmness, clarity and ingredients. JAM is made from crushed or ground fruit and usually has a thick consistency. JELLY is made from fruit juice and contains no visible pieces of fruit. It is clear and firm enough to hold its shape when turned out of the jar. MARMALADE is a soft gel with pieces of fruit and citrus peel. PRESERVES are made by cooking whole or large pieces of fruit in a thick sugar syrup. CONSERVES are a mixture of fruits, citrus fruit, nuts and raisins. Fruit spreads have a high sugar content and provide mainly calories (55 to 70 per level tablespoon). They should be used sparingly by persons concerned about weight control or sugar consumption. Low-sugar fruit spreads can be prepared from special recipes using non-nutritive sweeteners and gelatin or pectin substitutes. However, these products must be refrigerated or frozen to prevent spoilage because non-nutritive sweeteners cannot preserve fruit like sugar can. PECTIN is necessary for thickening or gel formation. It is present naturally in fruit and also is commercially available in powdered or liquid form. PECTIN is formed from protopectin as fruit ripens, or as underripe fruit is cooked. All fruits have some pectin. Apples, crabapples, gooseberries, citrus peel and certain plums contain large amounts of pectin. Other fruits, like blueberries, straw-berries, cherries, or huckleberries, contain little pectin and will thickenonly if combined with fruit rich in pectin, or combined with powdered or liquid pectin. Most recipes call for powdered or liquid pectin. Fresh pectin should be purchased yearly; old pectin may result in poor gels. Spreads made without added pectin require longer cooking and yield less product. ACID must be present in sufficient amounts for a gel to form. If natural acid is lacking, lemon juice or citrus fruit is added. Commercial pectin products contain organic acids, like fumaric acid. SUGAR helps gel formation, adds sweetness, and acts as a preservative. Corn syrup can be substituted for half the sugar. A light-colored, mild-flavored honey can be used inplace of one-third of the sugar. Too much honey or corn syrup will mask the fruit flavor and affect gel formation. For best results, always use tested recipes from a reliable source. Measure ingredients carefully and follow the directions exactly. Do not change the amount of sugar or fruit. Do not substitute one type of pectin for another. If you want a larger yield, prepare the recipe twice or as many times as necessary. Do not double the recipe since the larger quantity may not cook to the proper stage in the time suggested in the recipe. Likewise, do not cut the recipe in half. Many people prefer to make uncooked or freezer jams because they are quick and have a more pronounced fresh fruit flavor. Recipes for freezer jams are included with most pectin products. Be sure to follow the recipe exactly. Half-pint canning or jelly jars and selfsealing, two piece lids are recommended. Check jars for cracks or chips and check lids for dents or rust; these defects may cause sealing failures. Prepare the lids and bands according to the manufacturer's directions. To sterilize empty jars, put them right side up on the rack in a boiling water canner. Add hot (not boiling) water, filling jars and canner to 1 inch over tops of jars. Heat till water boils, then start timing. Boil for 10 minutes if your county's altitude is less than 1000 feet or for 11 minutes if altitude is over 1000 feet. Remove and drain jars one at a time. Leave hot water in canner for processing filled jars. Carefully follow the recipe and measure exactly. The method and order in which ingredients are combined depend on the type of pectin. Have jars and lids ready before starting to cook fruit mixture. Success in jelly and jam making depends on proper cooking and accurate timing. Jelly should be boiled rapidly, not simmered. Begin counting time when the mixture reaches a full rolling boil, one that cannot be stirred down. Pour hot mixture into sterile, half-pint jars leaving 1/4 inch head-space. Wipe jar rim with clean, damp cloth; place hot metal lid on jar with sealing compound next to glass and screw band down firmly. To prevent mold growth, flavor loss, change of color, and surface darkening, all cooked fruit spreads must be heat processed. Because of the risk of harmful mold contamination, paraffin seals are no longer recommended for sweet spreads. To heat process, place jars in water bath canner filled with hot water. Water should be 1 inch over jar tops. Heat to boiling, then begin timing. Process half-pints in covered canner for 5 minutes if altitude is less than 1000 feet, or for 10 minutes if altitude is above 1000 feet. Remove jars from canner and place on a rack or folded cloth away from drafts. Do not tighten the screw bands. When jelly has cooled completely, check seals by pressing on the center of the lid. The lid should be curved downward. If lid is down and will not move, jar is sealed.Refrigerate any unsealed jars. Overcooked jelly cannot be redone, but jellies that are too soft sometimes can be saved by recooking. Have clean jars and new lids ready before starting. Measure 4 cups of jelly; set aside. In a large saucepan combine 1/2 cup water, 1/4 cup sugar, 2 tablespoons bottled lemon juice, and 4 teaspoons powdered pectin. Heat to boiling, stirring constantly. Add 4 cups jelly and bring to a rolling boil over high heat, stirring constantly. Boil hard 30 seconds. Remove from heat, quickly skim off foam and fill sterile jars with jelly, leaving 1/4 inch headspace. Wipe jar rims. Adjust new lids and heat process in boiling water canner as directed. For each quart of jelly, have ready 3/4 cup sugar, 2 tablespoons bottled lemon juice, and 2 tablespoons liquid pectin. Measure 4 cups jelly into large saucepan and bring to a boil over high heat, stirring constantly. Remove from heat and quickly add the sugar, lemon juice and pectin. Bring to a full rolling boil, stirring constantly. Boil hard for 1 minute. Quickly skim off foam and fill sterile jars with jelly, leaving 1/4 inch headspace. Wipe jar rims. Adjust new lids and process in boiling water canner as directed. With these simple ingredients you can make naturally sweet, low-calorie preserves. The first time I made my own jam, I was shocked to find that the recipe called for more sugar than fruit. When I tried to reduce the sugar in the recipe, I ended up with a thin syrup instead of the thick, fruity jam I had envisioned. As I learned more about making preserves, I found out that pectin, a carbohydrate derived from fruit, is what causes jams and jellies to thicken, and it works best when a substantial amount of sugar is included in the recipe. But one type of pectin, low-methoxyl pectin, thickens jams and jellies with little or no sugar. This pectin makes it possible to create jams and jellies sweetened with honey, artificial sweeteners, the herbal sweetener stevia, or just with fruit. It’s even easier to make low-sugar fruit “butters,” such as peach or apple butter, because these are made without any added pectin at all (see Low-Sugar Fruit Butters). Like many foods these days, homemade jams and jellies often taste much better than store-bought. You can find good buys on quantities of fruit from local growers — check your farmer’s markets and classified ads. And if you’re too busy to make preserves when the fruit is ripe, you can freeze it and process it later when time is not at such a premium. Both jellies and jams are made with sugar and pectin: The difference is that jelly is made with fruit juice, while jams are made with crushed or mashed fruit. With most fruit pectin, recipes must include 55 percent to 85 percent sugar to allow the interaction among pectin, sugar and fruit acids that causes jams and jellies to thicken properly. That type of pectin is derived from ripe fruit, but low-methoxyl pectin is extracted from citrus peel and thickens when you add calcium phosphate. It was popularized in the early 1960s by naturalist Euell Gibbons, after his diabetic brother began experimenting with it to make jams and jellies with less sugar. Low-methoxyl pectin is now available from most health food stores and some supermarkets. It’s sold in small packets that include calcium phosphate powder and will make up to 18 cups of jam or jelly — it’s also sold in bulk; one source is Pomona Pectin. I like to follow the simple formula for using this pectin found in Carol Hupping Stoner’s 1977 book, Stocking Up, but you will also find a detailed instruction sheet inside the package. Although some references advise making several small batches, I have had excellent results making batches up to 30 cups at a time. 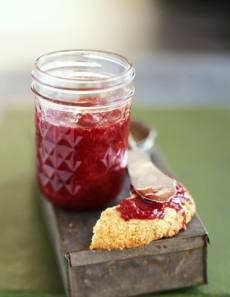 For jams, use one-half to three-fourths teaspoon of pectin for each cup of mashed fruit. For jellies, use three-fourths to 1 teaspoon pectin for each cup of fruit juice. Mix a half teaspoon of the calcium powder with 1 cup of water to make a calcium solution. For each cup of fruit or juice, you will need 1 teaspoon of calcium solution. For low-acid fruits, such as sweet cherries, peaches or plums, add 1 tablespoon lemon juice for each cup of fruit or juice to enhance flavor and thickening ability. For each cup of fruit or juice, I would recommend one-fourth to one-half cup of sugar, or one-eighth to one-third cup of honey, but you can adjust the amount of sweetener to taste. Follow the product directions to find out how much to use in place of sugar. 1. Prepare the fruit or juice. Berries can be mashed and simmered, then put through a sieve to remove some of the seeds, if desired. For jelly, simmer the fruit, then place it in a jelly bag and allow the juice to drip into a bowl. You also can use prepared or frozen juices. Measure the fruit for jam or the juice for jelly, and then place it in a stainless steel, heavy-bottomed pot. If you are using low-acid berries or fruit, add the lemon juice. Bring the fruit or juice to a boil. 2. Mix the pectin with the sweetener. Pectin shouldn’t be added directly to your fruit or juice, because it will stay clumped together. If you are using sugar or honey, mix the pectin with the sweetener until there are no lumps or pockets of pectin. Prepare the fruit or juice the same way, but incorporate the pectin by blending it with three-fourths cup of boiling water for one to two minutes, then stir it into the fruit or juice. If you are using only fruit without additional sweeteners, follow the same method, blending pectin into three-fourths cup boiling water, fruit juice or apple cider. 3. Pour the pectin and sweetener mixture into the fruit. Do this as the fruit is slowly boiling, stirring it thoroughly. I use a whisk to make sure the pectin doesn’t clump. Return the pot to a full boil that can’t be stirred down. 4. Add the calcium solution to the pot. This should be done quickly, because prolonged boiling of the pectin weakens it. For each cup of fruit or juice, add 1 teaspoon of calcium water. Be sure the calcium powder is fully dissolved. 5. Let the jam or jelly cool. Once the calcium solution is added, stir thoroughly and remove the jam or jelly from the heat. The preserves will thicken as they cool. At this point, you can test the jam or jelly’s thickness. Let a spoonful of the jam or jelly cool on a cold spoon or plate. If the cooled jam or jelly is too thin, add more calcium solution, 1 teaspoon at a time, and retest. If it seems too thick, add some juice, a half cup at a time and retest. Jams and jellies can be used right away, or they can be frozen or canned. To can, fill hot, sterile canning jars to a half inch from the top. Screw on two-piece lids and place in a boiling water bath for five minutes. Remove the jars from the water and let them cool, then check the seal. To freeze jam, place it in small freezer containers or wide-mouth jelly jars, let cool and place covered jars in freezer. Because of their high fruit content, these preserves must be refrigerated once opened or removed from the freezer, and they will keep for two to three weeks. If jam separates, stir it to mix the layers upon opening. Sometimes a small pool of moisture collects in the recesses of a partially used jar of jam. This has to do with the calcium. I either pour off the liquid or stir it into the jam. Making low-sugar fruit butters is even simpler than making low-sugar jams and jellies, although it takes more time. Fruit butters are simply puréed fruit that is cooked down to a thicker consistency. Fruits or berries can be cooked until soft, with or without the skin, then put through a sieve to remove seeds and skin. Spices or lemon juice can be added to the purée for extra flavoring. The purée then needs to be cooked down, essentially concentrated until thick. It can be cooked down on the stovetop in a nonreactive stainless steel pot, but it must be stirred constantly. My favorite method is to spread the purée 1 to 2 inches thick in stainless steel or glass baking pans. Place these in a low-heat oven, about 200 degrees. The purée will slowly concentrate and thicken. Stir every hour or so. To test the thickness of fruit butter, place a spoonful on a plate and let it cool a few minutes. If a ring of liquid forms around the butter, then it needs to concentrate further. Once it is done, taste for sweetness. The fruit sugars alone may be sweet enough. If not, add sweetener to taste and bake more if needed. A little lemon juice can add a nice zip to low-acid fruits, such as apple or peach. Hot fruit butters can be canned the same way as jam or jelly. Take care to remove air bubbles from the butter as you fill the jars. Cook and mash the berries, making 4 cups mashed purée. Add lemon juice if desired. Stir the pectin powder into the sweetener, mixing well. Make a calcium solution by mixing 1/2 teaspoon calcium powder with 1 cup of water. Bring fruit to a boil that cannot be stirred down. Add the sweetener, whisking it into the boiling berries. Return to a boil. Add 4 teaspoons calcium solution. Stir well. Pour into hot sterile jars. Seal and can or freeze. Makes 4 to 5 cups jam.